Opening Moments partners with seasoned, event production industry professionals to create visually exciting, memorable events that return value and increase performance. 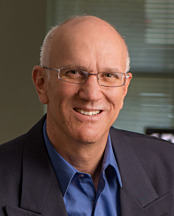 Our comprehensive, event management services include rehearsing with your key presenters, designing custom graphics and motivational videos and connecting you with motivational speakers - all designed to engage audiences to dramatic effect, while delivering if not exceeding desired results. 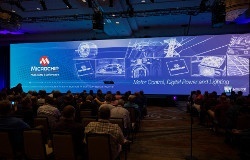 Microchip Corporation hired the experienced team at Opening Moments Media to produce a 2-day general session featuring 30 minutes looping motion graphics walk-in as well as backgrounds for the Keynote that also featured PowerPoint & IMAG. Opening Moments was commissioned by Microchip to design an 80' X 20' motion graphic to create a 30-minute looping motion graphic to showcase the major product categories that utilize Microchips. 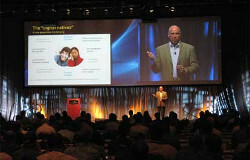 This set the tone for the Keynote with President Steve Sanghi who spoke to 800 engineers. 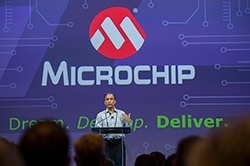 In supporting the overall look and theme of the event, Opening Moments Media designed wireframes of the major product categories that utilize Microchips; the walk-in looped for 30 minutes to inspire design ideas in engineer attendees. 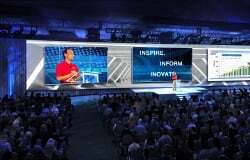 Opening Moments Media's sweet spot is delivering 100-2000 guest events - 4 full screens & creative staging - fully engaging those in attendance. 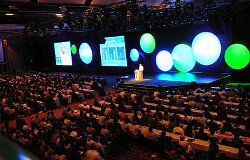 We take into account the room, audience size & content for National Sales Meetings: critical factors in successful event production & planning, evidenced in this theater-like, 750 attendee presentation. 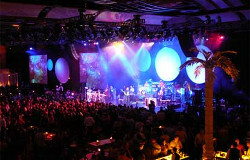 Superstars Earth, Wind & Fire performed for our pharmaceutical client - our planning made for a seamless & unforgettable experience for 2200+ guests.